WHY CHOOSE ELEX TO INSTALL YOUR GATE? …It’s an open and shut case. At the moment we don’t know the reasons behind your search for an automated gate. What we do know is that our clients want a gate system that stands the test of time. Rightly so. That’s why we take quality seriously. And unlike some other installers, we don’t just talk the talk. For starters we only use components made by the two most reliable manufacturers in the business. (BFT and Nice, in case you were wondering.) Everything else is done in-house. Your gate will be designed and built from scratch by our fabrication and joinery whizzes, who are capable of crafting minor masterpieces from timber and metal. We trust our abilities too – and think you should be able to do the same. So we offer lengthy warranties and comprehensive maintenance plans. But that’s not all that makes our service stand out. Understandably you want to work with the best contractor for the job. Someone who can work smartly, safely and securely. But sometimes choosing a tradesman can feel like a bit of a stab in the dark. Working with Elex need never feel like a gamble. And we have all the right industry accreditations to prove it. Here’s what they mean for you. 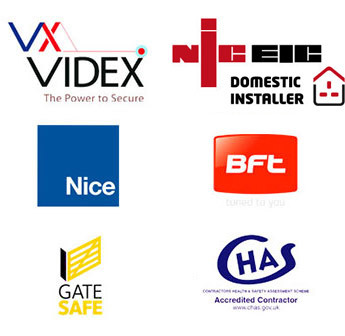 NICEIC (mouthful alert: The National Inspection Council for Electrical Installation Contracting) is the UK’s independent voluntary body for the electric industry. They help to regulate and maintain standards among electrical contractors for the benefit of customers. 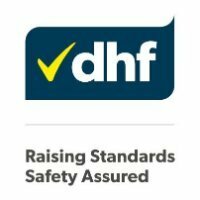 The Approved Contractor Scheme is designed to give customers a register of contractors that have demonstrated the ability to work to a specific level of competence and safety. As an approved contractor you can be confident in our abilities. And any work we do for you will come with a safety certificate to confirm that your installation has been designed, constructed, inspected and tested in accordance with NICEIC standards. As we said a little further up the page, we only source automated components from BFT and Nice. They’re the most reliable manufacturers in the business, which is why we are delighted that both have accredited us as approved installers. It means they are confident that we know their products inside out. Better still, we can source them at short notice for the best price possible. Savings which we pass on to our customers. Sadly there have been a number of serious incidents resulting from incorrectly installed electronic gates. Gate Safe is a charity founded to improve the safety of automated gate systems – and they have joined forces with The Institution of Occupational Safety and Health to create a training course for gate installers. It’s a course intensely focused on gate safety and legal regulations. We passed with flying colours. We’re a small team and that’s just the way we like it. It allows us to run a really tight ship, to give our engineers autonomy, to help each person in our business feel like they are making a difference. Which they are. And our clients notice. You see, we know that it can be a pain having contractors working at your premises. Which is why we respect your property, working only at a time that suits you, keeping the noise down and tidying up after ourselves.